The Delta Bes-Align 4 x 4" Adjustable Lens Board, calibrates lenses for maximum sharpness, as well as checking for fall-off, lens distortion, edge sharpness, and parallel alignment. The board adjusts front to back, left to right with three control knobs. A test negative is included for calibration, with the 4 x 4" lens board. The Bes-Align may require a retaining ring, depending on the lens. 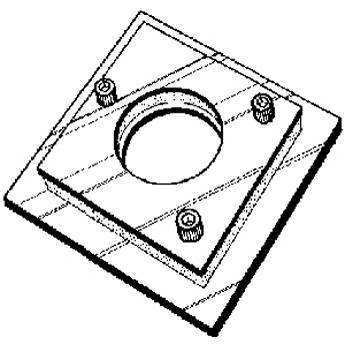 Box Dimensions (LxWxH) 4.2 x 3.9 x 1.3"
Bes-Align 4x4 Adjustable Lens Board is rated 5.0 out of 5 by 1. Rated 5 out of 5 by jascha from a must have for Beseler 45mxt ok, for any serious printer after tack sharp images corner to corner this tool is imperative. You just cannot align the lens stage on a Beseler 45mxt without this (maybe using some crude adjustment technique, possibly). I have struggled with this for a while and I came across this on a blog and it works perfectly. My lens stage, film plane and baseboard are aligned perfectly. You also get a tranperancy with it to help. You wont notice the differnce at 8x10 but 16x20 you will need it because parts of the image are clearly out of focus.